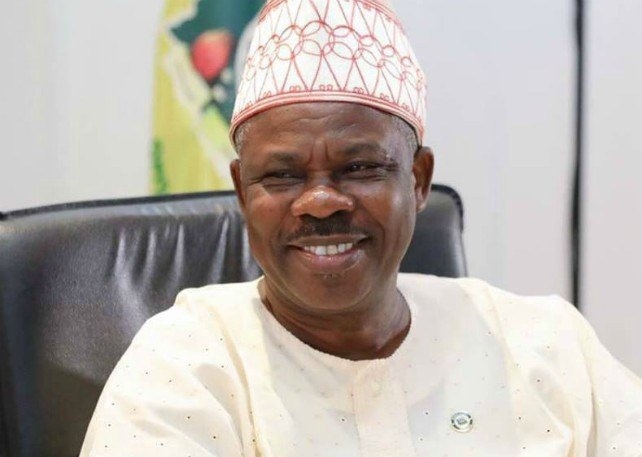 Ogun state governor, Ibikunle Amosun. National chairman of the All Progressives Congress, Adams Oshiomhole has continued to come under attack from Ogun State Governor, Ibikuun Amosun and his Imo State counterpart, Rochas Okorocha. Ogun State Governor, Ibikuun Amosun and his Imo State counterpart, Rochas Okorocha have continued their tongue lashing against the national chairman of their party, All Progressives Congress (APC), Adams Oshiomhole, after failing to win the acceptance of their favoured governorship candidates. Determined to meet the November 2 deadline set by the electoral body, the ruling party on Friday submitted the names of Hope Uzodinma and Dapo Abiodun as Imo and Ogun states’ candidates respectively. Amosun described as hypocritical, the basis for Oshiomhole’s rejection of the primary elections in the state, when they were based on the same consensus arrangement that brought him into office. He accused the national chairman of lacking respect for truth and decency. He was reacting to statements credited to Oshiomhole, accusing him and Okorocha of desperation in the bid to determine their successors. He added, “This is, however, without prejudice to the sanctity of the consensus arrangement, which Adams Oshiomhole hypocritically tries to demonise. Nigerians will recall that Oshiomhole himself was elected National Chairman of the APC by consensus arrangement, which witnessed all other contestants to the office being prevailed upon to step down for him. “The ground on which Oshiomhole disputes the gubernatorial primary in Ogun State is that the result was not announced by the State Electoral Committee from Abuja, therefore the governor resorted to self-help. In his own reaction, Okorocha, whose brother-in-law, Uche Nwosu’s candidature was dropped, said his administration was not surprised by the latest outburst of Oshiomhole. The governor responded through his chief press secretary, Sam Onwuemeodo. According to Okorocha, “With all that Adams Oshiomhole had said and done, he has only shown that he was the brain behind the film a man like Ahmed Gulak acted in Owerri as the leader of the 12-Member Committee sent to Conduct the APC Primaries in the State. And it is unfortunate that the National Chairman could encourage Gulak to flee Owerri by 4:30am to avoid carrying out the assignment he was sent to Owerri to do. “It has also shown that disbanding Gulak’s committee, cancelling all that emanated from that committee and setting up the Brigadier-General Ibrahim Agbabiaka Committee for the Conduct of fresh primaries in the state were all deceitful. We will now work to know whether such deceit would destroy all that the duly and properly constituted Agbabiaka’s Committee did. “Also, ignoring the report of Prof. Osunbor’s Appeal Panel that declared Uche Nwosu the candidate of APC in the state was also an indication that Comrade had abinitio made up his mind on Hope Uzodinma. “However, steps would be taken to prove that deceits do not pay. We won’t allow these deceits just go like that without having them challenged. Oshiomhole had accused Okorocha of trying to build a political dynasty, and this was described as blackmail by Okorocha. Oshiomhole said it was wrong for him to be struggling to go to the Senate and his in-law, Nwosu, was wanting to be governor. He stated, “Governor Okorocha is not the only governor who would want to be in the Senate after leaving office. A good number of the ex-governors are either in the Senate or had been in the Senate. He is not also the first governor to have a successor at the end of his tenure as governor. Uche Nwosu being his in-law cannot be allowed to decide the political fate of the young man. On the $2 million Ahmed Gulak alleged that Okorocha offered him to favour Nwosu, Onwuemeodo wondered why it took Gulak over one month to publicise his claim. “All these are their antics to blackmail Governor Okorocha. How come he fled from the state by 4.30am and since that time till now, he had not revealed that he was offered such money by the governor,” Onwuemeodo stated.